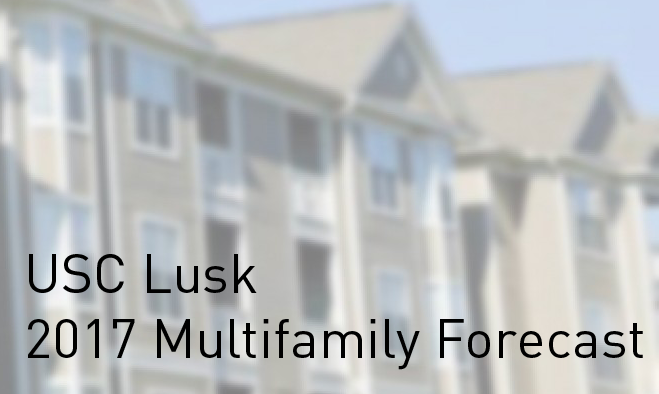 An overall reduction in multifamily construction continues to push San Diego County towards higher rents, so suggests data presented by the recently released USC Lusk 2017 Multifamily Forecast Report. The study, which surveys multifamily conditions in the Los Angeles, Orange County, San Diego, and Ventura submarkets, suggested that historically low multifamily construction conditions nationwide will continue pushing rents higher. “(Here) we are, seven years into an economic recovery, and we still do not see new residential construction returning to normal levels”. The report goes further to suggest that from the period of September 2016 to August 2017, national housing construction saw only 1.2 million starts. That resulted in 11% lower multifamily construction than average. What is the result of this lack of construction? Forecast researchers suggest that, with nearly 9 years of stagnation, national housing is three million units short of demand. Throughout the state of California, the effect of the national housing shortage is being felt in a lack of available units and higher rents, even as employment and financial conditions for tenants improve. The study further noted that heightened housing costs have resulted in more people leaving homeownership for the rental market in an attempt to save money. The study pointed to San Diego County as a prime example of how current national trends are affecting housing despite strong local economies. “San Diego County, like the rest of Sothern California, is experiencing an ongoing decline in homeownership” the study noted, “between 2010 and 2015, the number of renter households in San Diego grew by 9.3% while the number of owner households grew by only 1.2%”. In addition to housing costs, the study suggested that another possible reason for homeownership decline was due to the delayed home buying of the millennial generation. The forecast reported that San Diego continues to strengthen in rent growth as vacancy rates and multifamily construction continue to fall in the region. This increase in rents is being helped by regional economic strength. County-wide, the unemployment rate dropped to below 4.3% in July 2017 noted by the study as a “0.4% decline from the year before” The trend of upward mobility for a growing San Diego economy will likely result in as much as two years of rising prices, sales, and rents for the region. The average effective rent for the county is currently $1,926/month with rental growth rates ranging from 1.5% to 3.5%. This trends San Diego rents above the Inland Empire, but slightly below those of Los Angeles and Orange County. Vacancy rates overall in 2016 ranked at an average of 3.9% county-wide. Vacancy was particularly low in North County (3.7), but increased significantly for the City of San Diego (4.4). The study also noted that this number was well below that of the Inland Empire (4.5%). Like the rest of the nation, San Diego’s housing supply continues to trend behind demand. Forecasting future stock in the study suggested that an uptick in multifamily units will continue, “albeit slowly”, but that “rents and occupancies will continue to increase supply, while growing, will be insufficient to catch up with local demand”. This trend in upward mobility for rents, lower vacancy rates, and low construction supply mean there is still a lot of time to optimize San Diego multifamily investing returns.